I would like more information about 5255 Veronica St, Los Angeles, CA 90008 MLS #19445516. Mid-Century VIEW home with a semi-circular driveway located in highly sought after Baldwin Vista! This 3BR, 2BA home has stunning views of nearly all of the LA basin; Downtown LA from the front yard, Century City & West Hollywood Hills from the backyard. This home, with more than 2, 150 sqft of living space, boasts a living room w/hardwood floors, a wood burning fireplace that opens to the dining area. The kitchen has ample cabinets, eat-in area and beamed ceiling. The master bedroom has a walk-in closet, en suite with a spa tub & a steam shower. The 2nd bedroom is nice sized, with a vanity dressing area and its own entrance to the hallway bathroom. The 3rd bedroom has a wood burning brick fireplace, built-in shelves and a slider to the backyard. The open gravel and concrete backyard is a canvas for you to create your own oasis to enjoy the spectacular VIEW! The cabana feel covered patio area has an above ground hot tub & swing. This home waiting for you. Come be the newest neighbor! 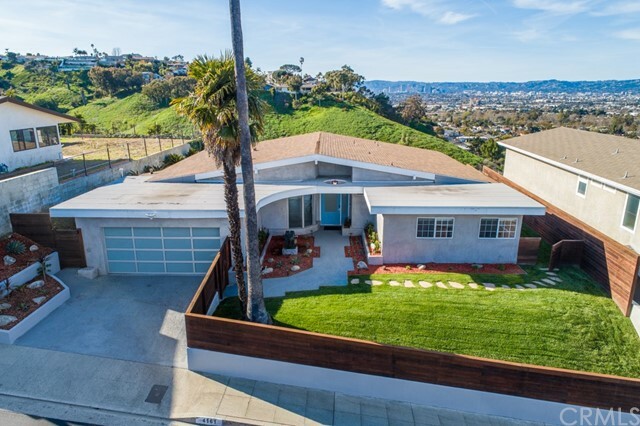 The property on 5255 Veronica St, Los Angeles, CA 90008 is listed for $1,775,000 as MLS #19445516. This 3 bedroom, 2 bathroom 2,166 sqft Single Family Residence built in 1952 located in Los Angeles, CA 90008. For more information regarding this or any other property in Los Angeles, please contact us at (424) 272-1339.